Go ahead, ask if you’re going to need one. The answer is yes, yes you do. So now it becomes a question of what type. First, do you need an enterprise level VPN? Your law firm probably does, and you might even want a more serious VPN option for your home network if you do a lot of work there as well. The benefit to those types of VPN is that they protect your connections with your office server, and also go a long way to protecting your web browsing while you’re using the same router. For these, the available solutions are myriad, and a little too varied and purpose-specific for me to discuss in great detail here. I’d strongly recommend speaking to your IT people/contractor about this. Second, do you need personal VPN technology? Once you’re outside of your office environment, you’ll no longer be protected by your office’s VPN. So, if you use your laptop, tablet, or smartphone both for personal web browsing/email and to connect to your office network, then you absolutely need to have VPN technology on your devices. How many devices can be hooked up through the same account at one time. Obviously, this will have a greater impact if you’re looking to protect all the devices in a small law firm at the same time. Additionally, there is a difference between simultaneous and concurrent (for some dumb reason). For example, ExpressVPN only allows 1 connection, but you can be on both your iPhone and laptop at the same time. The more servers available, the better your connection is likely to be. While all VPN services will cause your speed to decrease somewhat, going with a VPN service with more available servers means you’ll be able to switch in the event that one is congested. The more countries available, the better your connections will be when you travel. More countries also means better likelihood of getting around certain geographic limitations on internet use! There are no activity logs kept by any of the companies on this list (a requirement of mine), but many still keep some form of logs about how and when you connect to their service. Timestamp Logs: These are the “when” numbers – what time and date you log on and log off. Bandwidth Logs: These are the “how much” numbers, recording the amount of data you download and upload. This information is usually used by the VPN service as baseline information for their service needs. IP Address Logs: These are the “who” numbers – recording the IP Address of the device or router you use to access the service. For privacy-minded users, VPNs that keep logs of your IP address will likely be a red flag. 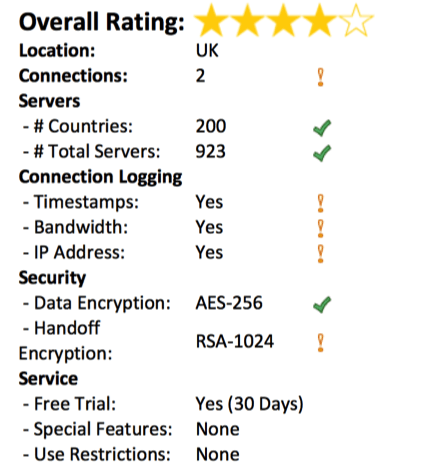 This category looks at the quality of the encryption that each VPN gives to your traffic. 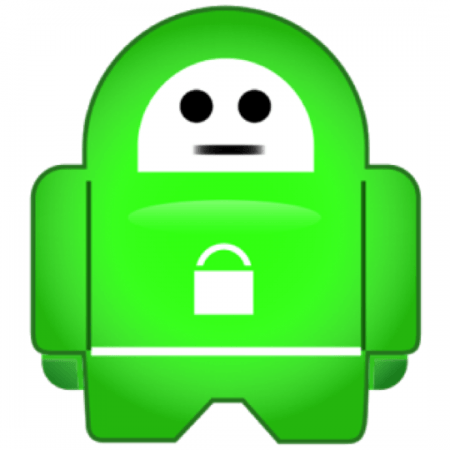 They all offer OpenVPN encryption, which is currently the best standard available. Handoff (aka RSA Handshake/Key Encryption): This is the encryption used to verify the “digital signatures” of website security certificates. Speed: While I have not included any detailed speed tests, some of the reviews below include information from my own tests or from reputable tests performed by others, if I found them statistically significant and important. Obviously, you’re not looking to take a trip back to 1995, so speed is probably a little bit important. Additional Security Features: Some VPNs offer features that help block malware, phishing attempts, and block ad trackers, but most don’t. Usage Restrictions: While some VPNs restrict bandwidth or certain types of connections, only one on this list does so officially (TunnelBear blocks P2P). However, some have bandwidth restrictions on their free versions, so be mindful if going this route! Client Diversity: Not all of the services on this list support all possible devices (particularly Windows Phone!). Make sure you know what you need and what you’re buying! ExpressVPN has servers in more than 78 countries, and just based on my personal experience, you’ll never have an issue finding a server nearby. 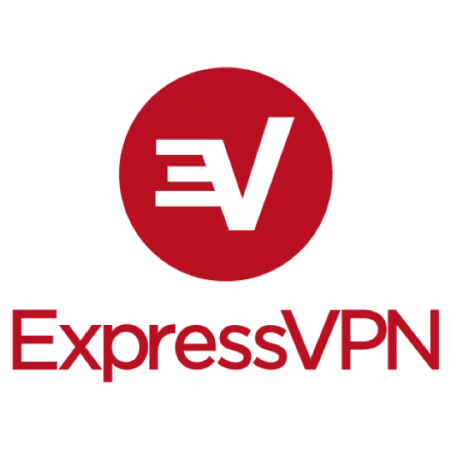 ExpressVPN is a fast and reliable VPN service. 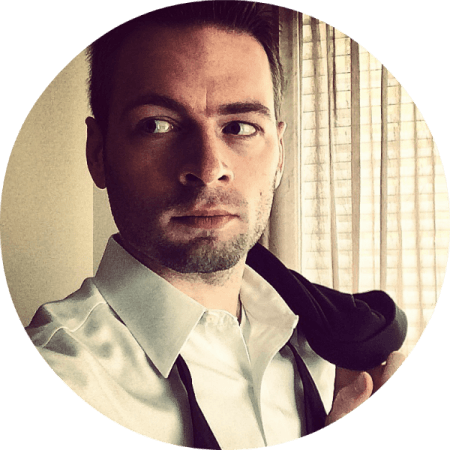 Among the major service providers, none are as regularly praised for their quality customer service, should you need it. It’s location doesn’t hurt, for privacy fanatics. The biggest weakness is that you only get one connection (or two devices, on the same account) at a time. Additionally, ExpressVPN doesn’t log your IP address, which is important, but they do keep limited logs of when you connect and the bandwidth you use. 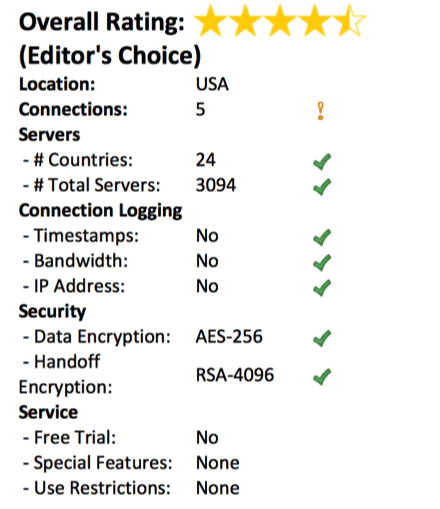 While ExpressVPN is one of the pricier options on this list, it’s an Editor’s Choice based on its capabilities, speed, and incredible customer service. 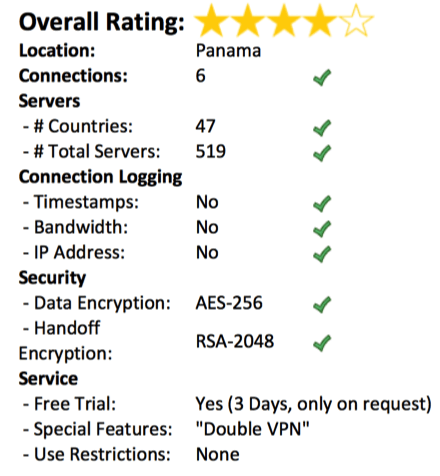 ExpressVPN is my favorite service on this list to use, it works well on mobile devices, and I’ve never experienced any trouble connecting, no matter where I’ve been. 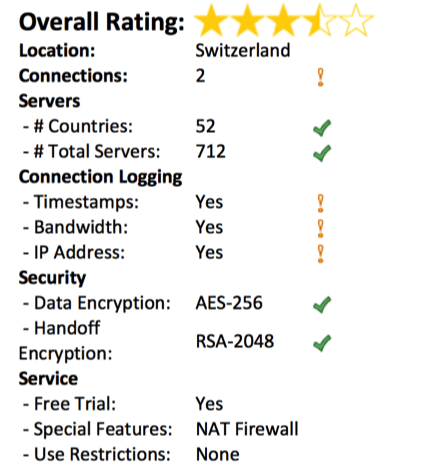 Is it the best VPN technology on the list? That’s up to you. No VPN service on this list offers the security tools that Freedome includes. With protection against malware, phishing tools, and an ad tracker-blocker built in, you won’t get a more secure internet connection from any comparable service. Oh, and all that is on top of Freedome providing some of the best encryption available. Another great feature of Freedome is one of the quickest and easiest to get up and running, and few have a more intuitive user interface. There is no monthly rate, and no discount for multi-year commitments, making Freedome easily the least flexible service on this list when it comes to price. Further, the number of servers available to connect with are on the low end compared to similar systems. The ability to only connect three devices to each subscription is quite limiting, as well. At least one major publication has also indicated that Freedome had inconsistent results when tested for downloading and web browsing. For the security-conscious, there’s no better option. 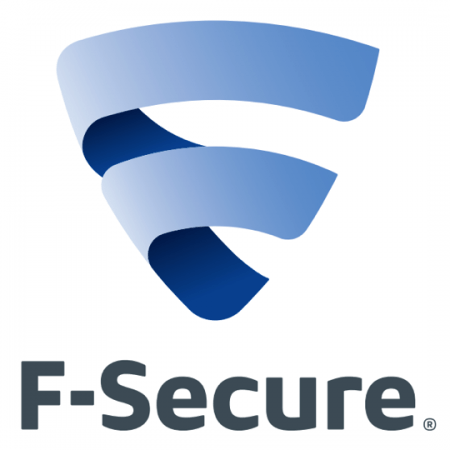 As one of the most recognized names in internet security and privacy, F-Secure’s Freedome VPN doesn’t disappoint from that perspective. However, an inflexible price schedule, while comparatively inexpensive for full-time users, really reduce the potential utility of Freedome. However, if making sure you’re protected from malware and ad trackers are high on your list when looking for online security, Freedome is the one for you. First, it has the best name. Period. Next, as another long-existing and highly rated provider, HMA! has a ton of servers in pretty much every country on Earth. You’ll pretty much never run into any issues with speed or availability. With unlimited bandwidth, you’ll never have to worry about your service being limited because of your usage. Additional anonymizing features are quite nice, as well. Unfortunately, unless you’re setting HMA! up on your home router, you’re going to be maxed out at 2 computer users at a time. Additionally, although it’s their policy not to turn over their connection logs, they do keep logs on the date and time of your connections, your bandwidth use, and your IP address. HMA! has also defended its role in identifying one of the LulzSec hackers to the British government, in the event that gives you pause. Interestingly, given its location, HMA! is actually required to keep a lot more data on its customers than its U.S. counterparts (because there is currently no legal requirement that U.S.-based VPN companies keep any records on their customers – although if they do, they’d be subject to government process just like anyone else). Despite its history of complying with a government investigation into hacking – and discussing it in a manner that disturbs me somewhat – HMA! remains one of the best options to protect your systems while surfing the internet. Given it has more server options than any service on this list other than PIA, HMA! 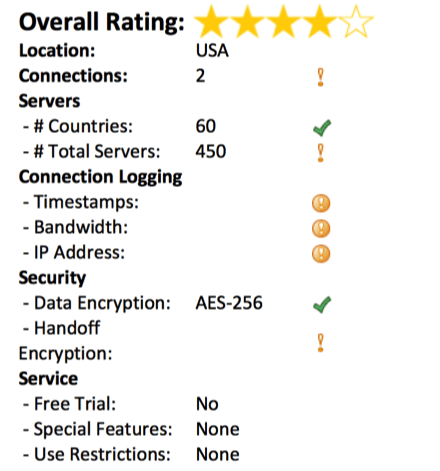 is definitely one of the best VPN options available. 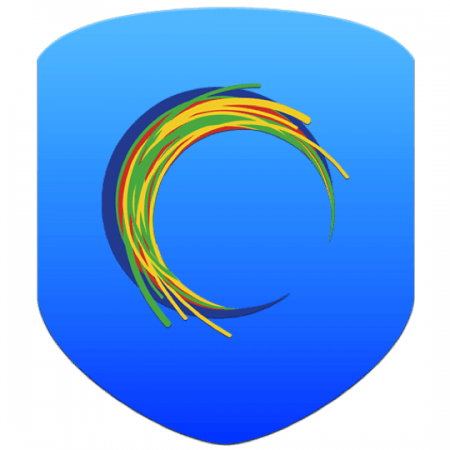 Hotspot Shield offers a very user-friendly system for protecting your online web browsing. In addition to encrypting all user traffic, Hotspot Shield also uses its database of nearly 4 million malicious websites to let users know when it’s landed in hostile territory. Of the services on this list, only Freedome provides more added security features. Additionally, despite a low server count, Hotspot Shield has demonstrated a smaller impact on user speed than many other VPNs on this list. To go with top-notch data encryption, Hotspot Shield’s data privacy protections are significant as well. Hotspot Shield’s most obvious weakness is the number of servers available – very minimal compared to other platforms. Additionally, there are no specialized servers for video, and Mac users will find even fewer servers available. For the price, it doesn’t provide as many features as some of the other platforms on this list. While it has a free version available, do not use it. The free version is supported by ads, and accompanying ad trackers, that usually serve as a reason for using a VPN in the first place. A very accessible system, with ease of use being among the priorities, Hotspot Shield offer a lot to like in its paid (“Elite”) version, including malware blockers and malicious website warnings. While it doesn’t have the global server availability as other platforms on this list, it’s impressive nonetheless. Armed with a ton of servers in 60 countries, you’ll never have to worry about access when using IPVanish. 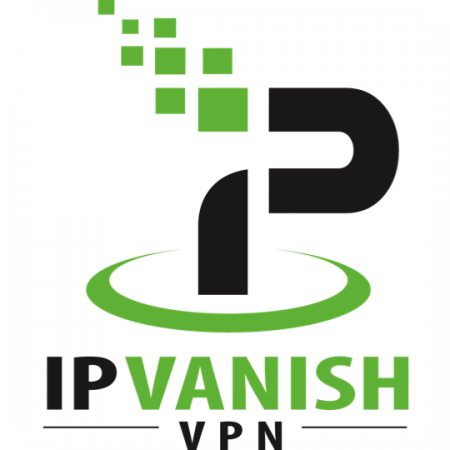 One key feature that you get is shared IP addresses (of which IPVanish has more than 14,000), meaning that you’re traffic is going to be anonymous to anyone other than you and IPVanish. As far as the latter goes, they also don’t keep any logs of your connection, either (although stating so more clearly in their TOS wouldn’t hurt). Only two devices can be connected at any given time, making IPVanish decidedly limited. Furthermore, only one of those connections can use the OpenVPN protocol, which offers the most secure connection (notably, this doesn’t matter if one of the connections is a mobile device, which doesn’t use OpenVPN, but rather uses L2TP). In some performance tests, IPVanish was slightly slower than other entries on this list. There have also been some reports of inconsistencies on the mobile platforms, and some have also taken issue with IPVanish’s claims of quality (e.g. “100% Online Security” and “the only true tier-1 VPN service in the world”) as either untrue or pure marketing bluster. IPVanish has been around for a while, and only PIA offers a significantly greater selection of servers worldwide. Additionally, the shared IP system provides the privacy-minded user with even greater levels of security. However, in performance tests, IPVanish doesn’t quite perform up to the same level as PIA, and some of the claims it makes regarding the quality of its service – although it’s definitely not alone in the industry – strike me as unprovable boasts. Another highly acclaimed service, NordVPN is an easy to set up and easy to use system. With up to six simultaneous connections available, it might be the best package tool for your law firm’s devices while on the go (and outside of the protection from your law firm’s primary VPN or firewall). 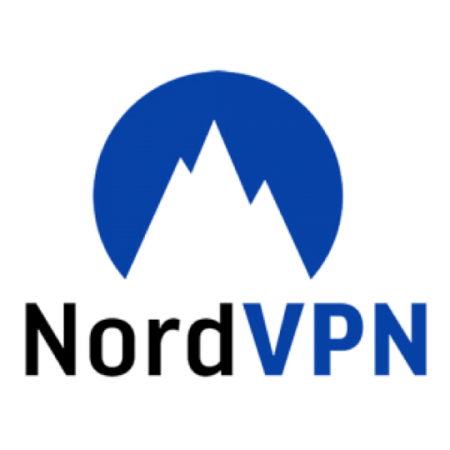 NordVPN is also the only service on this list that affirmatively states in its policies that it keeps NO logs of your connection – via timestamps, bandwidth records, or IP address. Speed. Pretty much every review of NordVPN, while praising its user-friendly design and interface, indicated that NordVPN ranges from slightly-to-noticeably slower to load media-heavy pages. However, it was also noted that the quality of the performance, once loaded, wasn’t noticeably slower. NordVPN offers some excellent security features, including its unique “Double VPN” option, at a price competitive with the other top VPN apps on this list. 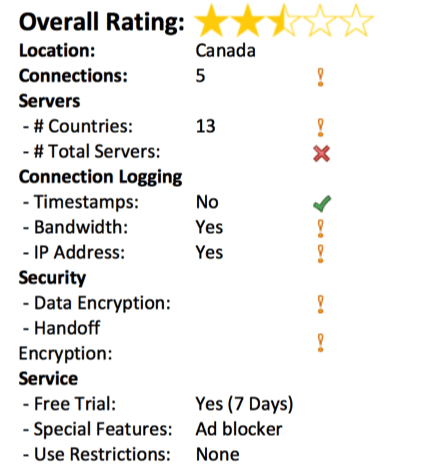 Combined with the excellent encryption offered, and the most privacy-friendly connection logging policies available, only the indicated issues with loading speed really separate NordVPN from the top performers on this list. One of the oldest and most reliable VPN services available, PIA is an established name in the VPN industry with a lot of trust and credibility built among its users. With a massive number of available servers to connect to, you’re never going to be hindered by lack of access or over-worked servers (or, if you are, it’s easy to find another!). With solid encryption standards, PIA offers some of the best protection you can get,. Although PIA is committed to protecting your privacy, there are two major issues working against them. First, being based in the U.S. could pose problems should congress or the FBI come knocking. Second, although they take care to protect your information, there’s no official policy regarding how they track your connection, including your location and IP address. 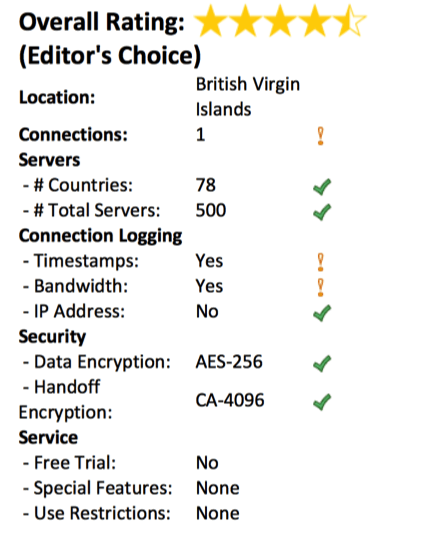 One of my two Editor’s Choice VPN services on this list, PIA offers just about every feature you could possibly want in a VPN. Given its minimalist approach to the user interface, this particular product is probably better suited for more experienced users, whereas ExpressVPN might be a little better for those wanting more direct control or having less experience. Hard to go wrong, though, really. 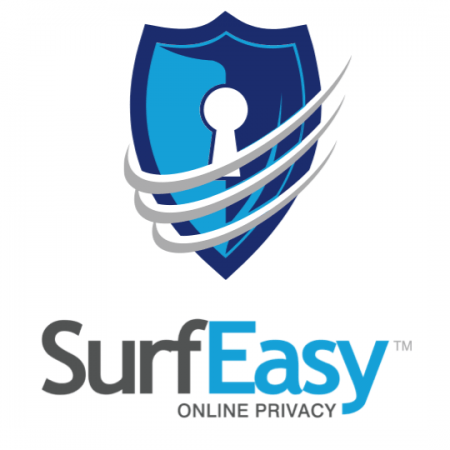 Straightforward and easy to use, SurfEasy VPN provides for secure access for up to 5 devices at a time. Solid encryption is further enhanced with ad tracker blockers, which help to keep your internet traffic anonymous. The weakest part of SurfEasy VPN has to be the general lack of documentation available. While it’s clear how many countries they have servers in, their overall number of servers is nowhere to be found. Additionally, while they expressly do not track the date and times of your logins, they do keep logs of your bandwidth usage and your IP address (although they do not share them). Additionally, a detailed search of their website does not reveal what standard of encryption they use to protect your connection. 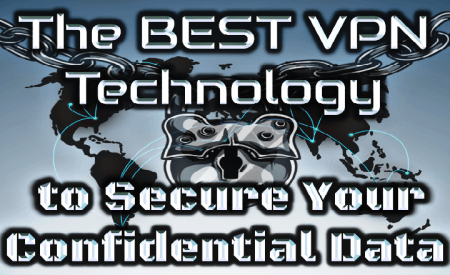 Despite being one of the easiest to set up and operate of the VPNs on this list, the general lack of available documentation makes it difficult to recommend this particular VPN service. However, it does test well on mobile devices, and has a price point that’s difficult to beat. Around for a long time, TunnelBear has a large, effective network, spread across 14 countries. Despite not listing the number of servers available, they always rate incredibly high in customer satisfaction. So even though it’s difficult to promise you won’t have issues due to lack of servers or congestion, experience says it’s true. TunnelBear doesn’t keep any logs of your connection times or IP address, providing a guaranteed level of privacy only matched by a couple services on this list. Moreover, you’ll get top-notch encryption, guaranteed. The availability of a free option (1 device, 500MB per month) can’t be ignored either, for users who only need a VPN for certain, specific situations. First, TunnelBear is the only service on this list that does limit your connection. As firm opponents of Peer-2-Peer downloading, you’ll not be able to access any bit torrent downloads through TunnelBear. Another nit-picky problem is that they do keep logs of your bandwidth – partially, I assume, to enforce their “no bit torrent” policy – which is kind of a drag. 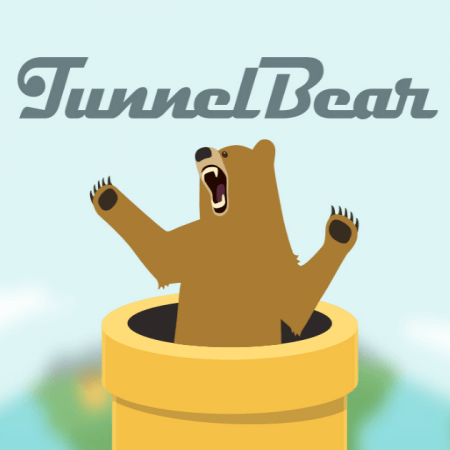 TunnelBear is the mid-sized sedan in the world of VPN providers – reliable, effective, inexpensive, but also lacking in many of the frills of other top VPNs on this list. While the restriction on P2P access costs them in my evaluation, it might not in yours. The availability of a free version is huge, too. With plenty of servers available in a large number of countries, you’re likely never going to run into any issues with speed or congestion based on your location. 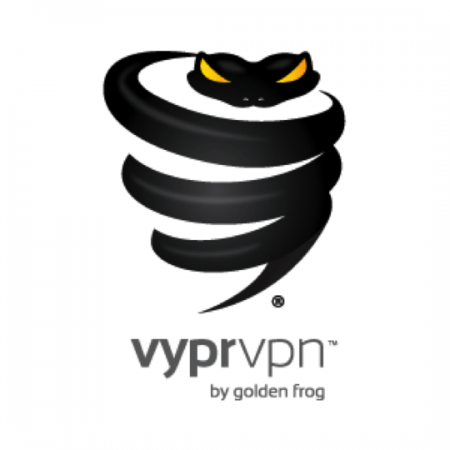 Additionally, Vypr VPN owns all of its servers, so none of your clients’ information gets transmitted via third-parties over whom Vypr has little or no control. The inclusion of the NAT Firewall feature, which essentially provides a firewall against trackers and malware for your device as if you were operating behind your law firm’s office firewall system, is more than just an added bonus. Unfortunately, Vypr does keep logs of user connections, albeit for just 30 days. Even though they expressly state that they don’t share the data, it reduces the overall security level you get from the VPN – as any logs are potentially capable of being hacked or demanded via service of process. Additionally, even the highest pricing tier only allows access for three devices. The best part about Vypr is that the NAT Firewall can give you added piece of mind – your secure web browsing protects your data, while the NAT Firewall protects your computer or device while you do so. However, the fact that in order to gain access to protection for your iOS or Android device, along with the excellent NAT Firewall system, doesn’t kick in until you’re paying $15.00 per month is a bit pricey as compared to the other options on this list. More importantly, Vypr is one of the few services on this list that, per its own policies, does keep limited logs on all three major connection points, which could raise some privacy questions. I have been using PureVPN for some months now and found it quite reliable VPN service. 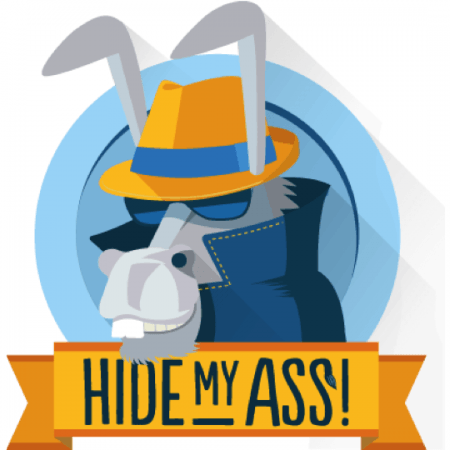 I am happy to recommend it to others for security, privacy and anonymity.